Colonel Gaddafi has announced that the Libyan government is ready for peace talks with NATO, calling on the coalition to halt its fire. 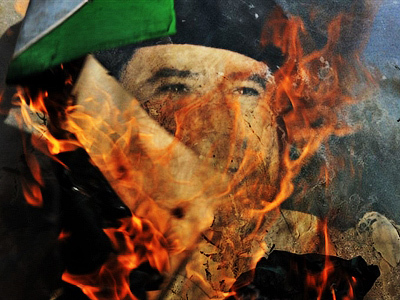 NATO says it will not consider the offer until Gaddafi stops his attacks on civilians. According to the Libyan leader, who offered to begin peace talks in a live TV address on Saturday morning, the possibility of a ceasefire is hampered by NATO airstrikes. He called on the coalition to stop the strikes, saying "We did not attack them or cross the sea … Why are they attacking us?" 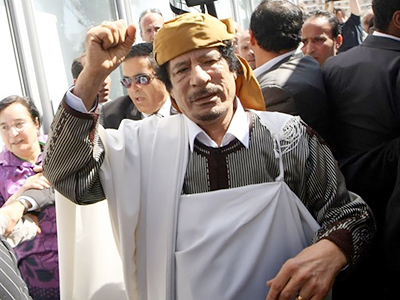 Gaddafi also asked the rebels to lay down their arms, saying Libyans should not fight with each other. A NATO representative, as quoted by the Associated Press, said the coalition wants deeds, not words. Gaddafi has already called for a ceasefire several times in the past, but at the same time continued to attack rebel cities and civilians, the report says. 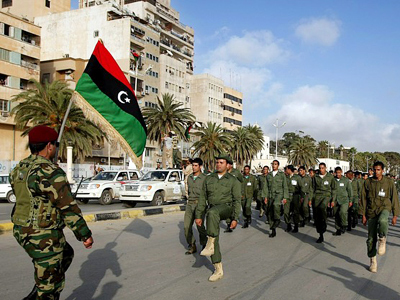 On Saturday, the Libyan opposition rejected Gaddafi’s offer for a ceasefire between the government troops and rebels. “We have lost faith in Gaddafi’s regime”, stated the official representative of the Libyan oppositional National Transitional Council Abdel Hazif Guga. “The time for peace talks has gone, the Libyan people do not want Gaddafi’s regime to play any role in their life”. “Gaddafi is insincere. We do not believe him”, said Ahmed Bani, an opposition representative in Benghazi. In his address Gaddafi denied accusations of massive killings of civilians and proposed that NATO gives him back a thousand people killed in the civil war and air strikes. After that, he announced that if peace talks do not start, his army will continue to fight. 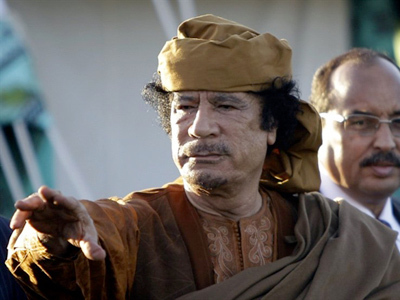 Despite all the demands of the rebels, Gaddafi stated he will not give up power and will not leave the country, claiming he has sincere support among his people: “I’m a sacred man for Libyans. I’m their symbol, I’m their father”. He also pointed out that the coalition’s actions went out of the frame of the UN resolution, and urged Russia, China and some Latin American and African countries to persuade the UN Security Council to review the resolution. 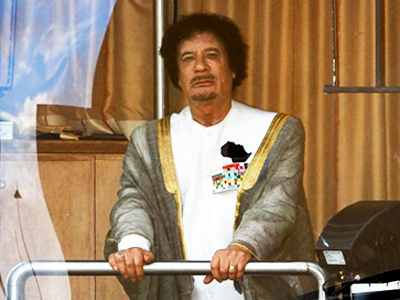 After the address was over, Libyan state television announced that during the broadcast NATO forces bombarded the building adjacent to the one where Gaddafi made his speech. 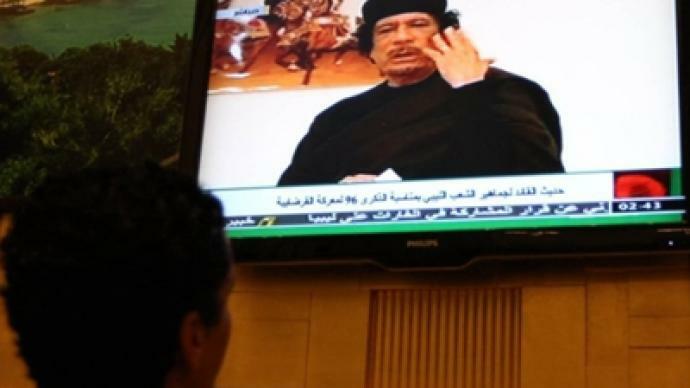 Libyan TV called this attack an attempt on Gaddafi’s life. 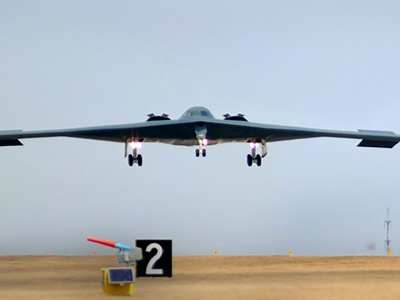 The Western operation in Libya began on March 19, after the UN Security Council approved a no-fly zone resolution. After a month of fighting with no evident success on either side, the situation in Libya came to a stalemate.